‘Holy priceless collection of superheros Batman!’ Recently in the media, there has been an influx of superheros and superheroines. From Superman to Spiderman, and to Marvels ‘The Avengers’ coming out in March, there is always another hero here to save our figurative day. However over the Christmas season, as we tell our children tales of the ultimate superhero who came to earth and died to save us all so we can spend eternity in heaven, it’s nice to find resources to help us as Christians to share the ‘good news’ in such an exciting way with our family. 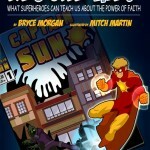 We all know that ‘with great power comes great responsibility’, so Pastor Bryce Morgan has used his power of the knowledge of Christ to create a totally awesome superhero named ‘Captain Sun’. "Rescue Me! What Superheroes Can Teach Us About the Power of Faith" is not a simply a ‘Christian’ comic/graphic novel. It’s a classic superhero story that kids of all ages will love. Also, it’s more than a comic book/graphic novel! 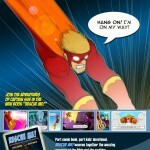 Each comic chapter is followed by a short kid-friendly lesson that connects the theme of that chapter to the timeless truths of God’s word. This is a great resource for any child, and is available for purchase on Amazon.com, direct from the publisher, or in special edition format from Lulu.com. You can learn more about the book, see a preview edition of the book, and find information about buying the book here at the official Captain Sun website. You can also stay updated by subscribing to that site or by following Captain Sun on Facebook at www.facebook.com/itscaptainsun. Signing off from your Friendly Neighborhood Epic Mom. Have a wonderful Christmas with your families, and a Happy New Year! Now ‘up, up and away’ to enter this awesome giveaway.